The schooner Utopia currently provides underwater remotely operated vehicle (ROV) programs while docked at Discovery Pier. Students develop teamwork and problem-solving skills as they fly a state-of-the-art ROV through an underwater challenge course. They also begin to understand the types of problems ROV operators overcome in occupations such as environmental research or oil and gas exploration. 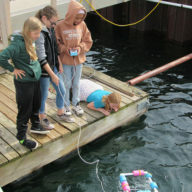 As they design, build, and test their own ROVs, they learn about buoyancy and underwater propulsion. A US Coast Guard license to carry passengers will open additional opportunities for students of all ages to learn aboard Utopia. The demand for Schoolship programs and summer educational charters has exceeded the capacity of the schooner Inland Seas, so the addition of this ship is timely. With Utopia, ISEA could double the number of individuals impacted by their shipboard programs every year. 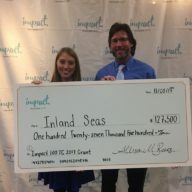 Other area nonprofits also benefited at the Impact 100 TC event. PEACE Ranch received a $127,500 grant, and Crooked Tree Arts Center, Disability Network, and Preserve Hickory will receive $10 for each Impact 100 TC member who joins for 2018.